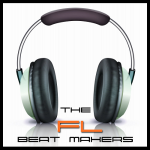 Today I want to talk about how to make beats in FL studio. The process of making high-quality beats takes a number of different steps. Some of these steps are essential and some of them are really at your own discretion but remember, how much work you put in is going to determine the quality that you get out. So keep that in mind when you set down to make your next beat. Sound selection – which is selecting the drum samples and instruments and various other elements that you will compose the beat with. Creating patterns that will later be combined to make up the beat. Constructing the beat using the patterns made in the previous step. Adding variations and transition effects and your beat tag. Mixing the beat – things such as setting levels, using EQ, compression, adding automation, etc..
And finally preparing the final exported version of the beat. One thing to note is that these steps are in the order that they should happen however, a lot of these stages definitely overlap one another. A good example of that is the initial sound selection stage. Typically when you go to make a beat you have an idea or a direction that you want to take the track but you may not have every single instrument, drum sample, or miscellaneous sample in mind that you will use throughout the entire production. It is very common to add more samples and instruments throughout the entire beat making process opposed to just at the initial stages. Another great example of this is the mixing stage. A lot of times you will probably find yourself doing some initial mixing during the creation stages such as getting levels sounding right, doing some slight EQ adjustments, and just making the composing stage more pleasant to listen to. So now lets go into the first step in a little bit more depth. When you set down to make a beat you usually have some inspiration built up and have some sort of idea of what the final outcome of the production will be. You will typically have an idea of what instruments or drum sound that you want. 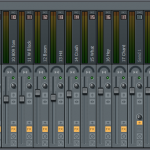 So the first step is finding those sounds and adding them to the FL studio step sequencer. I find it best to start with the essential elements that I need and add more as I go throughout the composing stage. So how do we add these elements to the FL Studio step sequencer? 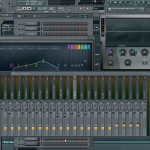 The easiest way to do this is using the FL Studio built-in browser. Using the browser you can drag and drop samples directly into the FL Studio step sequencer. For adding virtual instruments you can click on channel at the top, add one, and select the instrument that you would like to add to the step sequencer. Once you have laid out the instruments and samples that you want to use in your production it’s time to start composing patterns and building the foundation for your beat. When I sit down to make a beat I typically have some inspiration or idea for the track I’m trying to create. This idea will typically have some form of dominant element that I want to be the primary focus of the beat. This may be a specific drum sound I’m shooting for or maybe a heavily influenced brass instrument or whatever the case maybe. So, I start with that dominant element and begin composing the foundation of the Beat. The next step is to actually begin composing patterns that would become elements of the beat. For me, this is usually the chord progression or melody that inspired the beat in the first place. This typically involves playing around on the MIDI keyboard until I match what I hear in my head. Sometimes, this is not always an easy task especially for the beginner beat maker. The quick tip here is that you can actually hum the melody into your microphone and record it in Edison. Then you can use a tool within Edison to convert that to a Midi score. This method is similar to an earlier tutorial that we did on converting loops to piano roll notes. We will be putting together a tutorial for this soon, so we will keep you updated but it works the same way as converting loops. Should you compose in one pattern or multiple in FL Studio? Depending on your preference you may decide to compose the entire instrumentation within one pattern or multiple. I recommend that you do it in multiple for the simple fact that you can reuse those parts in that pattern later without having all the other instruments in the same pattern. For example, you might want to use just the bass line in another section of the song and not the entire instrumentation. This does not mean that you cannot compose in one pattern if you prefer to do so because you can easily copy or cut items from a channel or pattern to the next. You also have the option to duplicate patterns as well. 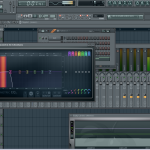 Continue building the instrumentation until you have your original idea conveyed in the FL studio project. Another quick tip here is that I find it useful to build a simple drum pattern similar to what I want the end result drums to be, but not fine-tune it at this stage. I find that working with a drum pattern opposed to the metronome can add some feeling and can really inspire me to make better productions. Working strictly with the metronome can be monotonous and uninspiring when trying to compose. Now, we are going to cover the playlist a little bit more later but theres something I want to point out here because it’s relevant to this stage of creating patterns. Above I mentioned that you should separate items out. For example, having your bass line on one pattern, having your drums on another pattern, having your synth lead on it’s own pattern etc. What you might wonder is how do you continue to compose if all your elements are on separate patterns. The easiest way to do this is create your first pattern and place it in the FL studio playlist. Once you have it in the playlist loop that region using the selection tool. Once you have done that go to the next pattern you wish to create. Before composing this next pattern, paint it in the playlist beneath the pattern you just added to the playlist. Now, make sure you are in FL Studio’s song mode. Now when you hit play and compose you will here the pattern you created in the first step along with the compositions in the pattern you’re now creating. You can now do this process over and over until you have completed the section that you’re composing. Once you have completed the first section of your beat you can then repeat these processes for the other sections such as the verse, hook intro, the bridge, or whatever it may be. Now let’s talk about the playlist a little more. In the last section we talked about creating patterns to make sections of your song. Essentially the playlist is taking those patterns and sections and turning them into a complete beat or song. So you want to think of your patterns as the elements that make up the beat that will then be arranged in the playlist. One way to think about it in simple terms is that your playlist is your canvas, and your patterns are your paint. You take your paint and apply it to the canvas until you compose a piece of art. Now I know that sounds very cliché but it really is the easiest way to describe it. So now we’re ready to start piecing together the beat with the patterns made in the previous step. If you used the method I mentioned above using song mode and putting your items in the playlist as you record, then a lot of that information is already in the playlist and you just need to move it to the right spot. For example, let’s say that in the above steps you created the hook as well as the main verse. Normally you will start out a beat with an intro. So now we can use our selection tool in FL studio to grab those arrangements we made earlier and move them to the desired location in the playlist. If you used the technique we spoke about earlier than you can quickly compose the other elements of your songs such as an intro or a bridge because everything is on separate patterns. With intros and bridges you can do things that create a buildup effect leading into the song. To do this you can start with some elements of the hook as your intro, and slowly build them up as you work your way into the main hook of the song. You can do similar things to create a bridge. Also, now that you have things on individual patterns you can use this to make variation in your beats because you can drop out individual elements at any time or add an individual elements at any time without having to completely change an entire pattern. So this wraps up the basic process of making a beat in FL Studio. We will go through more elements in detail later but this should give you an understanding of the fundamentals and the process as a whole. Have a question or want to submit feedback? Contact Us now!